Ed note: You might recall that yesterday’s post began with a note that said, Three magical things happened that night — the first you’ve already read about, of course, but there were two more. and the first of those started with nothing but a phone call. During dinner, Brooke and I sat across from one another. On her left was Aisling, on her right, Tristan. Tristan already had my heart. From the moment that I’d met him at Tuck’s memorial service, I was hooked. The gentle handshake. The poised and polite, “Thank you for coming.” The formality with a touch of the achingly familiar. During the dedication of the Wii cart at the hospital, he’d done everything that was asked of him, but otherwise kept to himself. He’d had his headphones plugged into his iTouch, and as the kids careened around the room, he’d watched the screen intently. At dinner, it was Brooke who was staring at the screen. The room was crowded and the table was loud. Katie and Finn were debating something at an octave that only preteens can hear. Jeni and I were laughing. Alex and Loch were talking. Aisling, to Brooke’s left, was looking to play. It was a lot to process and even more to manage. Brooke was holding it together, but not by much. The iPad was her lifeline. Tristan leaned in to see what she was playing, then asked a question. It was a perfect opening salvo for conversation. Ever so slightly, I panicked. He was too close. Not for anyone else, but for her. He was asking a question that she couldn’t answer. She has no idea that the numbers on top of the screen have meaning. ‘Scores’ don’t enter into her orbit. … and was desperately afraid of how this might go. Because his response was so incredibly sensitive, so empathetic, so generous. I explained that she was overwhelmed by her surroundings and that the iPad made it easier for her to handle. I wanted to hug him. On so many levels, I just wanted to hug him. And it struck me, just how amazing that moment was. How this poised and confident sixteen year-old young man, who occupies such a dramatically different place on the spectrum than my girl, looked at her and said, “I get it.” How, despite their stark differences, their commonality was clear. How generously he adjusted for her – his expectations, his approach to her – because he got it. How easily we talked about his diagnosis – and hers. How comfortable he was saying, “This is who I am.” How the words weren’t about labels, per se, but identifiers, common threads. How he intuitively knew not to take offense when she simply couldn’t handle interacting. I wrote to Jeni on Monday morning. “I’d like to write about the interaction between Tristan and Brooke,” I said. “But only if both you and he are completely comfortable with my doing so.” She promised to ask him and then we talked some more. We talked about comfort and confidence and their root cause – acceptance. “Acceptance is key,” she said. After spending time with Tristan, and all of Jeni’s kids for that matter, if she had told me that feeding them pinky toenail of newt every Thursday was the key, I’d go out and get some pinky toenail of newt. Because the proof is in the pudding, folks. But it turns out that her big secret is no secret at all. It’s the very equation upon which we’ve been working the whole damned time. No pinky toenail of newt necessary. I love this, especially the image. 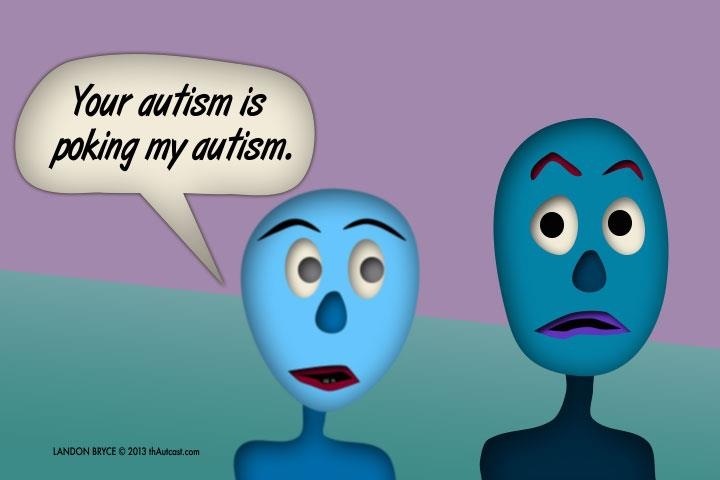 With two boys on the spectrum and a daughter who is a selective mute, there is a lot of autism poking in our lives. It also sums up how my son can become frustrated by other kids on the spectrum. We are working on those social skills. Jess, you are doing everything right and you can see the proof in Brooke. I think some of the strongest people I know are moms with kids on the spectrum. That is so sweet…you are absolutely right. If you could apply that formula to all Jr. Highs, especially girls, the world would be a much happier place. Unfortunately it seems acceptance is used as power and a commodity. In some ways, that is really the root of Stan’s comment yesterday….you want acceptance, but I’m not going to give it to you if it is incovenient for me. In many cases, girls learn how to barter acceptance at a younger and younger age. You can’t be in our group unless you do this…. If you’re friends with that person, you can’t be my friend. While special needs families may need to work harder at this, it is a universal formula that could change the world. I’d like to hug Tristan too. Such an awesome story about some awesome kids and their awesome moms. Once again, all I have is be still my heart! That is the perfect formula, beautifully said!